TD/OMS has multiple options available for comparing and merging sources. 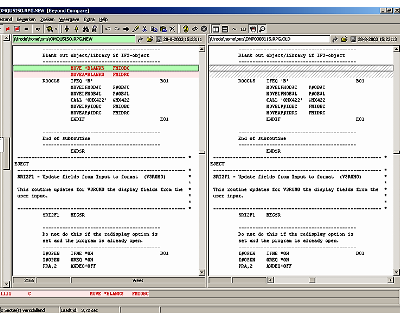 From the green screen, there is an option to launch a source compare & merge through the option "GUI Merge" which is available in the solution and objects display. TD/OMS source compare and merge enables a user to do multiple revisions and to merge old versions with new ones for internal use. 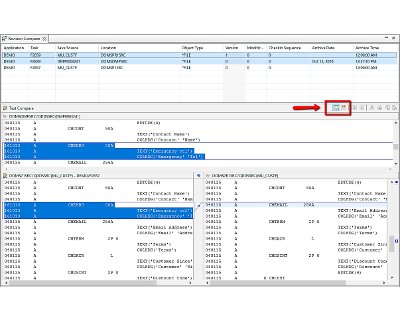 For users working in the TD/OMS RCP or RDi there is a 2 and 3-way source merge and compare function available which allows the user to perform a comparison of a source against a revision with the possibility to merge changes into the development source.